As we will no longer be attending Doll and Craft shows, we will continue to sell from this website under the conditions outlined below. Chessington Products specialise in the reproduction of porcelain half dolls, French Petite, Millette and a selection of larger dolls together with a number of accessories. Many of the half dolls displayed in this website are made from our private collection with others produced from commercial moulds. We hope you find this site user friendly. 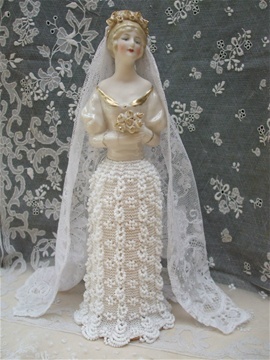 Our Private Collection half dolls are now shown combined with their beaded skirts where applicable. The details of the doll sizes and the materials needed for the skirts are all shown together. Where the commercial dolls have our designed beaded skirts, these are displayed in a similar way in their section. Postage, insurance and handling costs, dependent on destination, are additional to the published prices. Goods ordered will be mailed upon receipt of payment by PayPal, cheque or Money Order for purchasers within Australia. Cheques and money orders should be made payable to KEYVONT PTY LTD. Our PayPal address/account is also in the name of KEYVONT PTY LTD.
We ship worldwide upon payment by PayPal only. Click on PayPal link below to make payment.